The Harry Potter books almost have a complete world built in, thanks to seven books, several tie-ins, and, for better or for worse, whatever author J.K. Rowling decided to introduce in Pottermore. Despite all the detail that has gone into crafting his universe, there are still some things that can’t be accounted for—things that keep Potterheads up at night (Literally. A roommate and I spent two hours trying discussing the logistics of the first entry on the list). Photo credit: Harry Potter, Warner Bros.
1) What do kids do before going to wizarding school? Harry received his letter to Hogwarts on his 11th birthday, but what do kids do before then? On the first train at Platform 9 3/4, we see the Weasley’s board the train, leaving the youngest, Ginny behind with her parents. She’d get to attend school in the second book, but what was she doing this whole time while her brother Ron was getting up to hijinks in his freshman year? According to the Harry Potter Wikia, most wizard children are either homeschooled by their parents or are sent to muggle schools until they are of age. This is apparently something Rowling has mentioned, but I couldn’t find links to any of the interviews where she stated it. There is a Pottermore article where she says that many children are home schooled rather than go to one of the very few schools. The most logical explanation is that kids who end up at the schools are similarly educated before they leave. But that just raises more questions. Is there a universal curriculum for parents to homeschool their children, as there is in our world? It would make sense for wizards that come from muggle society to send their children to muggle schools, but what about those with wizard blood? If the latter do attend normal primary school, how do they manage to keep everything about their lives a secret? Even Harry, who had no knowledge of his heritage, accidentally performed magic on multiple occasions. I can imagine the ruckus a child claiming their parents have fought dragons. Although, anything a kid says could just be excused with normal childish imagination so maybe Rowling’s on to something. 2) Do wizards know math? We assume that wizards have to know basic mathematics due to potion-making’s similarity to chemistry, but what about anything beyond addition and subtraction? Us muggles had to learn the multiplication tables in elementary school and later, experienced the pains of long division, and that’s not including trigonometry and algebra—important things for engineering and scientists, but not too relevant for other people. Wizards wouldn’t have a need for complex math if most of what they do can be explained by magic. The closest we get to anything resembling mathematics in the Hogwarts course catalog is Arithmancy, thought of to be the study of predicting the future using numbers, but it’s an elective. It’s also not important enough to come into play throughout the books or for us to get to know the professor. The best explanation is that wizards are taught basic math, either at home or in muggle school, along with other skills such as reading, but since they almost never seem to use math after the age 11, how necessary is it? We can assume Goblins know all the math that the wizarding world would ever need, so maybe they don’t need it at all. 3) How many wizards are there in the world? The war with Voldemort could explain Harry’s small class size (since wars generally have a lower rate of newborns), but that doesn’t take into account the sparseness of wizarding populations. In the core books, we learn about three schools—Hogwarts, Durmstrang, and Beauxbatons—but in total there are 11 “long-established” schools that are registered with the International Confederation of Wizards, with smaller, less regulated ones coming and going. There’d have to be because the math doesn’t check out. If there are around 1,000 students in seven years of Hogwarts—including muggles without any original ties with magic—then that would imply that the wizard population in all the United Kingdom is miniscule, maybe less than one percent of the total population. And what about the US, for instance, where there only seems to be Ilvermony, which couldn’t possibly hold all wizard students from America and Canada (since there’s no school in Canada). And what about Mahoutokoro School of Magic in Japan? Does that imply that everyone in Asia has to go there? And that’s not taking into account the cultural differences between different Asian countries and how that is dealt with in the event that this is true. It would be interesting if the wizard population was so small, but considering what Rowling has built up in the wake of the Harry Potter series ending, things don’t add up. 4) How alive are portraits? This is more of an ethical quandary, but how are moving portraits associated with the people they portray? Would a portrait of Dumbledore be infused with the soul (if we’re using that as the marker of sentience) of the former headmaster even after his death? While Rowling does expand on it a bit in later books, it only raises more questions. DUMBLEDORE: Those that we love never truly leave us, Harry. There are things that death cannot touch. Paint . . . and memory . . . and love. According to Pottermore, the portrait is more of a copy of a person and its level of interactivity can vary. At the link, Rowling states that headmasters will often teach their portraits how to behave. So they aren’t alive in the same way that we are alive, but what is their level of self-awareness? They can move from painting to painting and be dicks to Hogwarts students if they want to, so what’s to say they aren’t alive in their own way? And if they are alive, do painters essentially have the power to create life? Are portraits ever aware that they can be alive? My theory is that they are separate entities from the people they are portraits of, so it’s not as if people like Dumbledore are immortal, but if that’s the case, then why does nobody question the ethics behind putting copies of dead people in the halls of schools? Now I’m thinking too much. 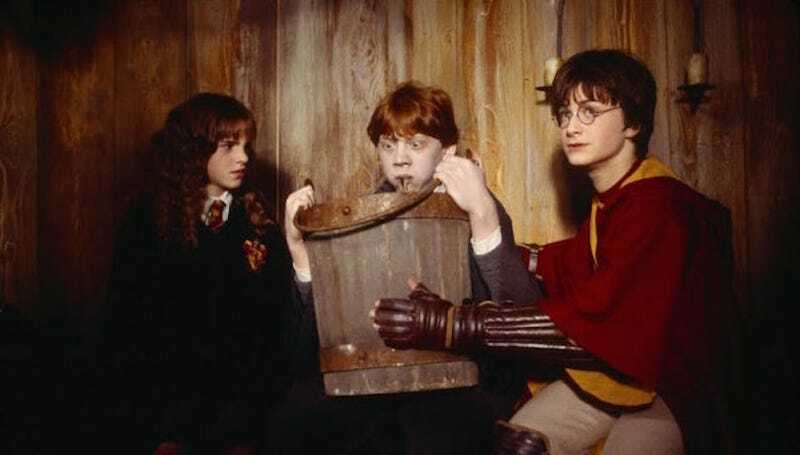 5) Why is Hogwarts so unsafe and who let this happen? Dumbledore is the worst. Or maybe he just inherited a literal death trap from his predecessors and there’s nothing he can do about it. Regardless, the monsters and objects that Harry and his friends find on the Hogwarts grounds are dangerous, and sometimes life threatening. Why would a campus have a tree that literally beats people up? Why would the Hogwarts Express employ a witch that tortures students? The worst part of all of this is that the rules are inconsistent surrounding children’s safety. In the first book, Dumbledore tells kids not to enter the Forbidden Forest, but we see our heroes enter it multiple times, sometimes under the supervision of staff. If they really didn’t want kids going in there, couldn’t they erect charms to keep them away? And what about the wars that seem to take place inside the castle? Before the battle at Hogwarts in the seventh book, it’s mentioned that many parents refused to send their kids to school that year, but what about the years before that? If it was known throughout the years that there were dangers that could kill students, why would they bother to keep the school open? And if parents still wanted their kids to get an education, surely they could’ve been sent away to other schools. Basically, Dumbledore is a terrible headmaster and the kids were in danger constantly. Or maybe Rowling needed all that there in service of a story. So maybe the latter makes more sense.